Mauritius remains the industry leader when it comes to holiday destinations. 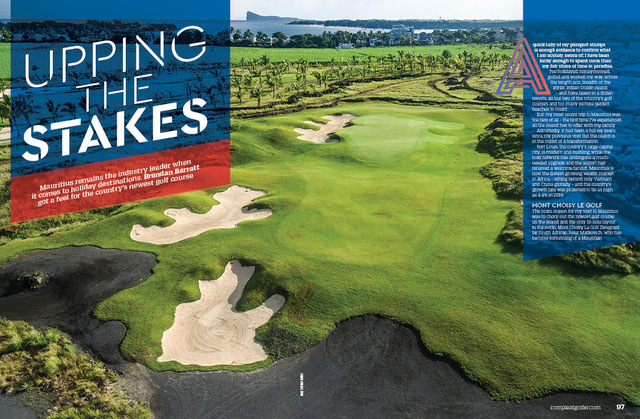 BRENDEN BARRAT got a feel for the country’s newest golf course, Mont Choisy Le Golf. A quick tally of my passport stamps is enough evidence to confirm what I am acutely aware of: I have been lucky enough to spend more than my fair share of time in paradise. I’ve holidayed, honeymooned, golfed and worked my way across the length and breadth of the idyllic Indian Ocean island – and have taken in a dozen resorts, all but two of the country’s golf courses, and too many picture-perfect beaches to count. But my most recent trip to Mauritius was the best of all – the first time I’ve experienced all the island has to offer with my family. Admittedly, it had been a full six years since my previous visit, but the island is in the midst of a transformation. Port Louis, the country’s large capital city, is modern and bustling, while the road network has undergone a much-needed upgrade and the airport has received a welcome facelift. Mauritius is now the fastest-growing wealth market in Africa – sitting behind only Vietnam and China globally – and the country’s growth rate was projected to be as high as 4.4% in 2018. The main reason for my visit to Mauritius was to check out the newest golf course on the island and the only 18-hole layout in the north, Mont Choisy Le Golf. Designed by South African Peter Matkovich, who has become something of a Mauritian golf course specialist (he is also responsible for the impressive Avalon and Heritage courses), the layout was officially opened in late 2017. There’s a strong South African connection at Mont Choisy that extends beyond the course designer. PGA professional Andy Bean is the general manager of the course, while former Capetonians Rory Taylor and Mark Segers ensure that the course is kept in tip-top shape. Mont Choisy is also represented by big-hitting South African professional Dean Burmester. Of course, that’s easier said than done on a layout that is fairly flat and exposed to the prevailing crosswinds. Truth be told, one tends to be grateful for any cooling breeze in the Mauritian heat, and the fairways, which appear intimidating from the tee box, are surprisingly generous. A variety of tee-box options allow golfers to select the relative difficulty of the course, with the front tee offering easier options than the championship back tee. From the back, the course measures 6 442m and presents a real challenge, so it would be no great surprise to see it hosting a professional event in the not-too-distant future. While the club’s website describes the opening hole as ‘gentle’, a prevailing left-to-right cross breeze makes the tee shot a little more complicated, while the shallow, raised green is tricky to hit with a longer-iron approach. The stroke-two 2nd hole may measure only 365m from the white tee, but plays straight into the sweeping wind. The 3rd is a classic Matkovich risk-versus-reward hole. At under 300m, players can either lay up with an iron or have a crack at the green, helped by the landing area being on a downslope. The par-three 4th plays downwind, and we found ourselves flicking short-irons into the 175m hole, revealing another quirk of golf in this part of the world – despite being at sea level, the ball seems to travel a club further than back in South Africa. Once golfers have safely negotiated the par-five 5th and the par-four 6th – two good holes that demand accurate tee shots – they are safely through the gauntlet and the course does ease up. A downwind par-five is followed by a short par-three with a green guarded by water right and a deep bunker to the left. Bean, being the ultimate host, was kind enough to show the ideal way to play these holes as he birdied both of them on his way to a score of level par. The front nine closes with a par-four that is the finest hole on the course. Until a decision was made to flip the two nines around, this was the course’s closing hole, and it is a real tester. Conservative golfers may opt for position and take a long-iron off the tee, but this brings water into play on the approach shot. Aggressive players will look to get their tee shots towards the corner of the dogleg, where the fairway pinches in. From here it’s wedge to the green and what should be, at worst, a comfortable par. Looking out over the course from the back of the 9th green provides you with a great perspective of the layout. It has little in the way of elevation changes, giving the course a bit of a links feel, yet the contouring of the fairways makes it hard to imagine this piece of land as the sugarcane field it was before Matkovich worked his magic. The par-four 10th hole presents an intimidating tee shot, and the approach, invariably with a long-iron in hand, is no easier. The par-three 11th and the par-five 12th present scoring opportunities before you reach another risk-versus-reward par-four at the 13th. With the wind at our backs we hit fairway woods into the green, but a breeze of any other direction would ask some serious question, as the fairway is split down the middle by a hazard. The par-five 14th hole is another Matkovich special. Reminiscent of the 12th at Steenberg in Cape Town, it is out of character with the rest of the course. The hole is lined on both sides of the fairway by dense palm trees. As if this wasn’t curious enough, a massive mound blocks the front of the green, preventing players from running any long approaches up to the putting surface. While this three-shotter is undoubtedly quirky, it is for this reason that it stands out as one of the more memorable holes. Mont Choisy’s signature hole is the par-three 15th, and it is a real beauty. The shot of around 100m is to an island green framed by the backdrop of the old sugar mill and some bright flame trees. A short detour from the green will bring you to a tortoise pen housing a couple of massive creatures that must be over 100 years old. The closing holes are a good mix of score-spreaders, starting with the long par-four 16th. The 17th is a par-three that can be stretched anywhere from 100m to over 200m, depending on the course set-up and which side of the bed the greenkeeper woke up on. Mont Choisy’s closing hole is an inviting par-five that gives golfers a real chance of making a birdie. Downwind, the 450m hole is reachable in two for many, and it’s no surprise that players are keen to take it on. ‘We’d like golfers to walk off the course with a smile on their face,’ said Bean. This popular five-star Beachcomber resort is located in the north of the island, situated between Grand Baie to the north and Port Louis to the south. The resort is one of the biggest on the island, offering a huge variety of accommodation options, from villas and beachfront suites, to the junior and family suites that are set slightly back from the shore, but within metres of an inviting swimming pool. From check-in through to mealtimes, room service, sports and activities, and throughout the general-use areas, every detail seems to be carefully planned, maintained and of the highest quality. What’s more, it is safe. There was no need to fret about the clothes I left on the beach lounger, the camera on my verandah or my phone in the room. This extended to Kids Club where I was comfortable in the knowledge that the children were not only safely looked after, but also having a great time doing activities such as crab-hunting, arts and crafts and swimming. The more adventurous may slip away to experience some of the resort’s many water activities, such as water-skiing, sailing, stand-up paddling, windsurfing or scuba diving, but for the most part it’s about worshipping the sun. Having tried snorkelling and taking the kids on a glass-bottomed boat trip, I turned my attention to the terrestrial activities on offer at Trou aux Biches Beachcomber. The resort has six floodlit tennis courts, a practice chipping green and a large, state-of-the-art gym, with the latter serving as an excellent way to shake off those extra kilograms the buffet table seemed eager to throw at me. From a golfing perspective, Trou aux Biches Beachcomber’s cosy relationship with the nearby Mont Choisy Le Golf means that after a quick shuttle ride, resort guests can play the new Peter Matkovich layout for just €50, including their golf cart and practice balls. In a country where visitor green fees range between steep and exorbitant, it’s a real bargain, particularly given the high quality of the golf course. Golf is growing rapidly, and new courses are popping up around the island. Mauritian courses recently hosted the AfrAsia Bank Mauritius Open and the MCB Tour Championship, professional events on the European and European Senior Tours respectively. The number of 18-hole facilities on the island has reached 10, together with a handful of nine-holers, most of which are attached to a specific hotel or resort. These arrangements allow guests the opportunity to spend time on the course at reasonable rates, yet for non-residents the cost of golf can be prohibitively expensive. A round of golf at one of the signature courses ranges from €120 to €175, so it is best to plan your golfing trip to Mauritius wisely.